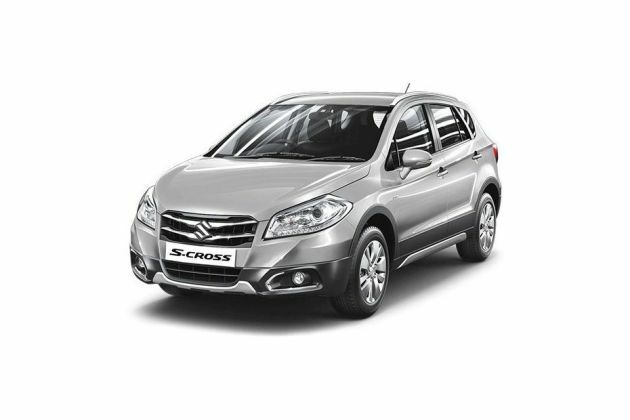 Maruti S Cross is a premium crossover that is being offered in several variants. One of these is the Maruti S-Cross DDiS 320 Delta trim, which is equipped with a 1.6-litre, DOHC valve configuration based petrol engine. It carries four cylinders and is paired with a 6-speed manual transmission gear box. This five seater vehicle comes with a spacious cabin that includes well laid seats, a smooth dashboard and some utility aspects. The steering wheel in its cockpit is mounted with audio controls, whereas the audio system has a CD player. A number of comfort features are also offered such as sliding front center armrest with storage space, electrically foldable door mirrors, power operated windows, and front map lamp to name a few. In terms of exteriors, it has a robust body structure that is fitted with some interesting aspects. On the sides, it has a set of 16 inch steel wheels covered with full wheel caps, whereas turn indicators are integrated to external mirrors. The radiant headlamps at front and a stylish boot lid at its rear end remain one of its key highlights. As far as the safety is concerned, it includes important features like engine immobilizer, TECT body structure, reverse parking sensor with display, central locking system and a few others that makes the drive quite safe. To begin with its front facade, it has a sporty radiator grille that includes two chrome plated horizontal slats. A prominent logo of the company is neatly embossed at its center. Just below this grille is a well sculpted bumper that comes along with a silver garnished skid plate. An air intake section is also fitted to it, which helps in quick cooling of engine. Another highlight is its large headlight cluster that includes high intensity headlamps and turn indicators as well. Then, there is a windshield available at front with a pair of wipers integrated to it. Moving to its side profile, there are black B-pillars, silver garnished roof rails, and body colored door handles. Its outside rear view mirrors come equipped with side turn indicators. Meanwhile, its wheel arches are fitted with a set of 16 inch steel wheels, which are covered with tubeless tyres of size 205/60 R16. Also, these are offered with full wheel caps that further adds style to its side profile. On the other hand, its rear end includes a wide windscreen and split combination lamps. The boot lid looks striking with a company's badge on it, whereas the bumper features a couple of reflectors and a skid plate as well. The automaker has designed its cabin in a splendid way and packed it with various useful aspects. Its seats are covered with high quality fabric upholstery and are designed to provide enhanced comfort. The door armrest has fabric inserts, whereas the AC louver knobs and parking brake lever have neat chrome plating. Turning to its cockpit, the dashboard is integrated with a TFT information display that includes a trip meter and gives notifications of fuel consumption and outside temperature as well. It also houses a steering wheel, AC vents, illuminated glove box compartment as well as center console. An accessory socket is also offered for charging phones, whereas its rear 60:40 split foldable seat helps in making space for more luggage inside. Besides these, the cabin also includes illuminated front foot well and luggage room, assist grips, and a few storage spaces as well. This variant has a 1.6-litre, DDiS 320 diesel motor incorporated under its hood, which performs exceptionally well. It has four cylinders, 16 valves and is based on a double overhead camshaft valve configuration. This can churn out a peak power of 118bhp at 3750rpm and yields torque output of 320Nm at 1750rpm. It has a total displacement capacity of 1598cc and paired with a six speed manual transmission gear box. This enables the vehicle to consume around 11.3 seconds to cross the speed mark of 100 Kmph and to achieve a top speed of nearly 180 Kmph. In terms of fuel economy, it can return about 17 Kmph within the city, whereas its maximum mileage comes to about 22.07 Kmpl on the highways. A highly responsive steering system is incorporated in this trim, which ensures good handling in any condition. It comes with a tilt and telescopic adjustment function as well. It is bestowed with a proficient suspension system that helps in maintaining stability at all times. Its front axle is assembled with a McPherson strut and the rear one has a torsion beam. Also, coil springs are loaded to both its axles for a jerk-free driving experience. In terms of braking, its front wheels are fitted with ventilated disc brakes, whereas the rear ones get solid disc brakes. Its occupants can listen to their favorite music through the innovative music system, which comes with a CD player. It supports USB, Aux-In and also Bluetooth connectivity. A total of four speakers are positioned inside the cabin that ensures excellent sound output. Then, there are power windows with auto up and down as well as anti pinch functions on driver's side. The outside mirrors are electrically foldable and adjustable, whereas both sun visors are fitted with vanity mirrors. It features a manual air conditioning unit with dust and pollen filter, while the front sliding center armrest comes with storage space. Other than these, it also includes sunglass holder, electric back door opener, bottle holders on door trims, keyless entry, as well as front seat back pockets, which adds to their convenience. This trim is offered with a long list of protective aspects that keeps its occupants safe while on their journey. These include the robust impact absorbing TECT body structure, anti theft security system, dual horn, headlamp leveling, and an engine immobilizer. Other than these, it also comes with features like anti lock braking system, airbags for driver and co-passenger, seat belts with pretensioner and force limiter at front, driver seat belt reminder lamp with buzzer and reverse parking sensor with display, which further improves the level of security. 1. Numerous comfort features are available. 2. Security is best guaranteed. 1. Engine vibrations are a bit disappointing. 2. Interiors can be made more appealing.